Our BI888 series 8 1/2 in. fit-ups clocks continue to be one of the best selling large fit-ups on the market today. The reason is simple-Value! You just cannot find a good large fit-up at a better price. The 8 ½” offers you a totally complete insert for those special project that demand a large clock. All models are offered with a black bezel only, and they are assembled in our California factory using a top quality quartz movement. This also allows us to offer the BI888 series fit-ups with a custom clock dial with an order as few as 50 pieces. All models fit into a 7-15/16n. 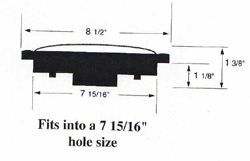 mounting hole size.